Deputy President William Ruto has waded into the debate over the souring relations between Uganda and Rwanda. Speaking at the 'Africa Now' summit in Kampala on Wednesday, the DP criticise Rwanda following its decision to close its border with Uganda at Gatuna. Ruto also made reference to Tanzania's decision to burn Kenyan chicks and also ban the grazing of cattle from Kenya in its country. "We have a border in one country being blocked by another country in East Africa, really? That makes us really concerned. We should actually be thinking of how to eliminate work permits. 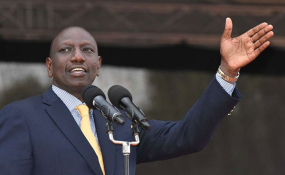 We should be thinking of how to integrate this region," said Ruto. "We are seeing cattle of people being auctioned when they cross some borders... others are banning chicken while some EAC countries are closing their international borders. The discussion we should be having should be over the East African federation. We should not be discussing closing borders. That, in my opinion, is a retrogressive discussion," added Ruto at the sidelines of the event. Rwanda recently shut the busy Gatuna border to commercial traffic in Uganda. Kigali later accused Kampala of harboring and facilitating dissidents to destabilize it and proceed to ban all Rwandans from visiting Uganda where it claimed they risked arrest and detention. President Uhuru Kenyatta on Tuesday made shuttle diplomacy between Uganda President Yoweri Museveni and Rwanda's Paul Kagame in a bid to diffuse the tension between these two countries.